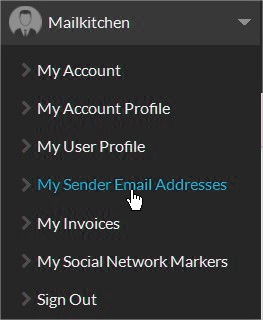 The address used for sending your email campaigns is by default the one that you used for creating your MailKitchen account. However, you should know that before being able to send your email campaign, you’ll need to validate the email address. Note : You should know that you can save up to 5 different sender email addresses. However, we recommend you to use different addresses only if the content of your email campaigns differs. In fact, when doing email marketing, it’s very important to use the same sender email address not to be identified as a spammer by email providers (ISP). This is how you are going to create your own sender reputation and increase your deliverability. Sending email campaigns to your recipients is quite different from sending a simple email from your own mailbox, that’s why you shoud keep professional and avoid using generic email addresses (Gmail, Hotmail, Yahoo, etc). These senders can easily be identified as spammy (because anyone can create a Gmail or Hotmail account) and therefore blocked by email providers. Sometimes, email provider completely block the bulk email campaigns sent with a personal generic email (this is for example the case of Yahoo that doesn’t deliver email campaigns sent with a @yahoo sender). You should therefore choose a sender email address containing the domain name of your website, for example contact@yourdomain.com. This way, your sender is in some way certified (a domain usually corresponds with a real entity or organization) and you have more chances to hit the inbox of your recipients. TEST Email – How to set a new test email address?